The OnePlus 5 is going to be unveiled on June 20th, with a launch two days afterward. 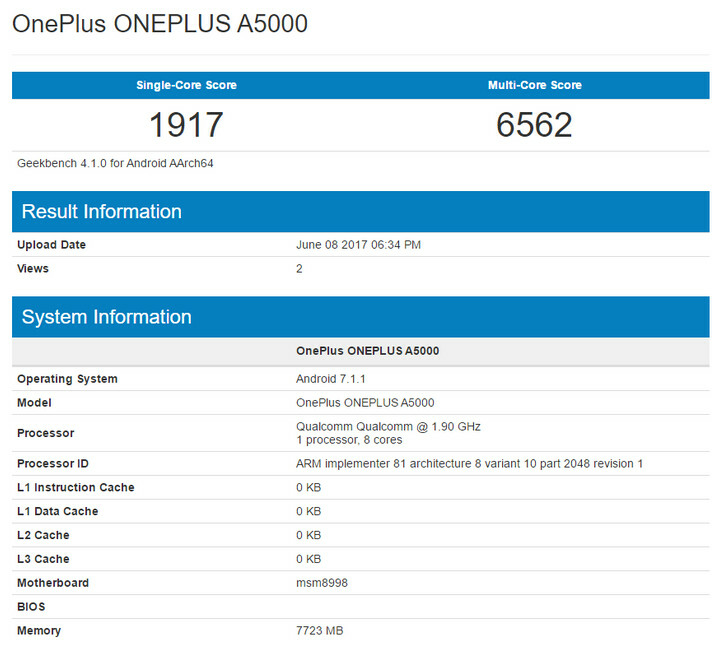 Source code discovered on Amazon India's OnePlus 5 page seconded the notion that the phone will be powered by the Snapdragon 835 chipset, carrying an octa-core CPU and the Adreno 540 GPU. The source code also revealed that the latest version of the flagship killer will feature 8GB of RAM for lag-free and smooth multitasking as users switch from one active app to another. Today, the phone made an appearance on Geekbench where all of the expected specs appeared. Yes, the aforementioned Snapdragon 835 chipset and the 8GB of RAM both surfaced. Android 7.1.1 is pre-installed. 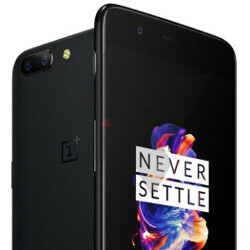 With a single-core score of 1917 and a multi-core score of 6562, the OnePlus 5 had a similar Geekbench score as the HTC U11 (1912 single-core and 6137 multi-core scores). That isn't too surprising since both are powered by Qualcomm's latest SoC. A 3300mAh battery is said to be on board the OnePlus 5, and the dual-camera setup on back includes one sensor that shoots in monochrome; this allows for sharper and more detailed photos. Based on a night-time picture allegedly snapped by OnePlus CEO and co-founder Pete Lau, the OnePlus 5 is going to take solid pictures even in low-light conditions. Lau has also revealed that the phone will be the thinnest among flagship models. For those people that have been clamouring for android on apple hardware, well, this is for you. Your dreams finally came true. In theory, this might even be the best phone of 2017 (so far) if the rumors are true. Dual cameras, sd835, metal, 3,300mah, stock android, 8gig ram, 128g storage, dark mode, beautiful (thin for those that like that kind of stuff), 1080p to aid battery even further including other features we've probably not heared of. So, i think this will be a hit for oneplus, at least for their standard. No 1440p, no Qi wireless charging. No sale. Even Apple this year will have 1440p and Qi wireless charging, so NO it is not Android on Apple hardware. So? And if you ever cared to notice.... 1440p or high resolutions aren't very special. FULL HD is just fine- High(er) resolutions don't do good for the GPU. "Never Settle"? I see tons of compromises in their specs for every model they've ever released. They have still never released a real top tier premium spec phone. Never. iPhone of LAST year. This year's iPhone will have 1440p AMOLED and Qi wireless charging. Just like OnePlus to stay behind. Those who have a problem with the design and price, simply just don't buy it. No one is forcing you to. 8gb ram, 128 internal with possibility of micro sd slot, a 3300 mAh battery​ at least with 5.5" screen, S835, great design(yes looks same as 7plus but who cares, looks nice), nice dual back cameras, latest Android with Great performance, close to stock android with nice customizations. All for just around $500. I don't​ see any single phone that is even close to OP5 in vfm. Haters just gonna hate. You forgot to add dash charge which i think they'll improve upon this year. another positive is it will be an amoled screen. I just pray it has stereo speakers. Yes... But (Comma) 1. The camera result will be poor. 2. The display quality will be no where near as Samsung's AMOLED Displays. 3. The battery life will likely be poor (considering the relatively tiny 3,300mAh battery). 4. The build quality will be decent; but it won't scream 'PREMIUM' like an S8 or G6. 5. And of course, it likely won't have any sort of dust and water resistant and no IP certification. "And one more thing": The price is expected to be around $550 so it's no longer a value for money or 'VFM' as you describe it... Thing is, there's no such thing as 'free lunch', mate... If they're giving a cheap phone with decent specs, then you better believe that they're cutting corners somewhere...! As the wise men say: "You get what you pay for". An S8 screams 'premiumness' from a mile away from its exotic aspect ratio and extreme screen-to-body ratio... G'Day! If 3,000 is sufficient for a 5.8" and a 5.5" qhd screens running custom software UX in the form of gs8 and htc u11, why do you think a 3,300mah would be insufficient for a 5.5" 1080p screen running near stock android? Btw, how do you know the camera will be poor? As for the price, we dont know that yet and even if it were true, that will still be cheaper than most flagships that'll come out this year. As for the premiumness and wow factor of the design and screen, well, its true, i'll give you that (Even if i know that like cameras, screen quality has reached a point of diminishing returns). That's a lot of speculation on your part. You know nothing as of yet about the camera quality, display quality, battery life, build quality, etc. As for value for the money, at $550 it will still be $200 less than the iPhone 7S or Galaxy S8, and even more for the iPhone 8. So yes, there is still value for the money. The price won't be 550, unless you go for max storage and memory. Resistance is something we canall live without. "Camera Result will be poor" Are you f**king kidding? Duo camera setup and teamed up with dxo in order to try and make their cameras great... "Higher resolutions=better" You would never notice unless compared to a 4k screen, with only SONY has. "Battery Life will be poor" Most phones sport around 3000 mAH batteries sooooooo.... Retarded much? Will sport the high end snap dragon and of course run faster than any phones out there (especially the s8, the lower resolution helps) Also, you can charge it like really fast....Also, use a f**king comma instead of (comma) You sir have proved your stupidity.Gtfo the webs. currently using 3t, it is among the best of.phones i ever used. It never lags or reboots, you just cant ask for more in terms of the price tag and perfomance. Iam sure OP5 will take.my money, i dont mind really if its an iphone clone, so long it looks like a phone. Dont let brand loyalty limit your choices, unwise to be a fanboy of anything. Only the back looks like an iphone. Like how the iphone 6 looks like htc from the back with those antenna lines. Even the iphone 6's anthenna lines doesnt entirely look like on htc's (htc's runs just across while the 6 runs across and on top to meet each other). The camera of the 6 is small and on the left while htc's is bigger and on the middle. The iphone 6's back is also flat while that of htc is curved. Now all these are obvious differentiations. Here, the problem people are having with oneplus is that they seem to have done a literal meaning of photocoping of the iphone 7 plus here. The anthenna lines are exactly thesame, the dual cameras are positioned thesame and designed thesame, they both have exactly thesame color finishes, ffs they even have almost exactly thesame dimentions (7.X x 7.3). I would get one if they'd come out with a bigger screen. Is OnePlus really doing iPhone cloning with the OnePlus 5? Uninspiring. Smooth operation on a smartphone isn't dependant on the amount of RAM alone. Any OEM knows that doubling the amount of RAM does not double the speed of a device, so they definitely didn't have "smoother operations" in mind when increasing the RAM capacity to 8GB... They had something else in mind - the pure benefits of more RAM, that is. Let's not forget that VR takes a lot of memory too. Ummm, that's they they using the newest storage system.... something 2.1 RETARD holy s**t. And RAM is always good. 4 gigs of ram feels awful for me. The design clearly shows that oneplus comes in chinese category phones. I would wait for the Oneplus 5T with upgraded S836 chip.